Giorgio Armani has launched Acqua di Giò Absolu Instinct, a new fragrance for men. 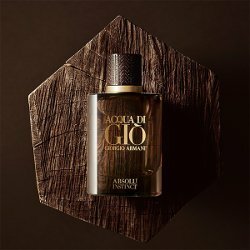 Acqua di Giò Absolu Instinct is a limited edition flanker to 2018's Acqua di Giò Absolu, which was a flanker to 1996's Acqua di Giò. Discover Giorgio Armani's new masculine fragrance, Acqua di Gio Absolu Instinct. The sensuality of Acqua di Gio Absou merges with the ultimate elegance of the most noble woods with marine notes, patchouli and warm woods accord. Acqua di Giò Absolu Instinct was developed by perfumer Alberto Morillas; additional notes include bergamot, lemon and ebony wood. Armani Acqua di Giò Absolu Instinct is available in 40 and 75 ml Eau de Parfum. Well, five if we don’t count the brand name — BUT STILL. 😁 Yep. I’m so impatient with that kind of thing now that I don’t even read past the third or fourth word. Also true when I cannot figure out where the brand name ends and the product name begins. Right? I have only so much space in my head, perfume house-people!